A rollicking space opera that twists breathlessly through a future of absurd decadence and immense possibility by a true American original. Deep in the bowels of Junk Moon, the finest scientists of Planet Immortal are nearing completion of Project Amphora, which aims to unlock the secret of immortality. The Project is run by the Consortium, twelve of the planet's most influential movers and shakers, but they aren't the only ones after immortality. Commander Jockey Oldcastle, a wise-cracking space pirate, has heard about the Amphora Project from a banished scientist who is convinced it will lead to the end of the world. Oldcastle sets off to find the project with Adrian Link, a timid botanist who wants only to tend to his plants on the Agricultural Plain, yet Oldcastle finds himself trying to unravel a strange mystery: It seems the Amphora Project is turning the citizens of Planet Immortal into crystal. As time runs out, it is up to Oldcastle and Link— and Link's exotic, unlikely love interest —to stop their mysterious extradimensional enemy before their world is lost forever. 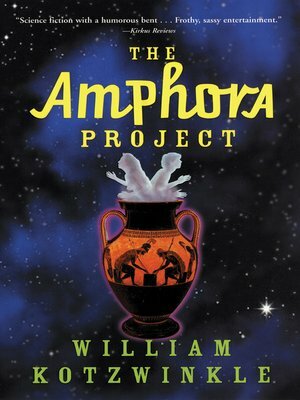 "An entertaining trip through an exotic future full of weird tech and plenty of heroics and adventure in the company of bizarre creatures" (Booklist), The Amphora Project "twists along at breakneck pace" (Publishers Weekly), combining elements of science fiction and fantasy while transcending the boundaries of both.